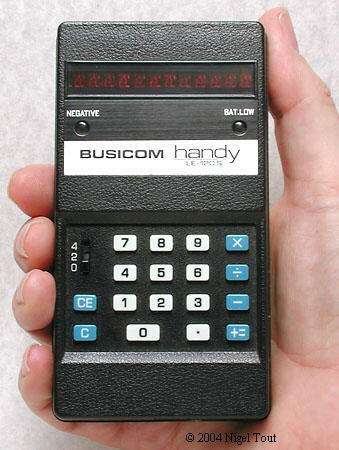 Busicom Corporation of Japan was a very innovative company and introduced the first hand-held calculators that were small enough to really be described as "pocket-sized". 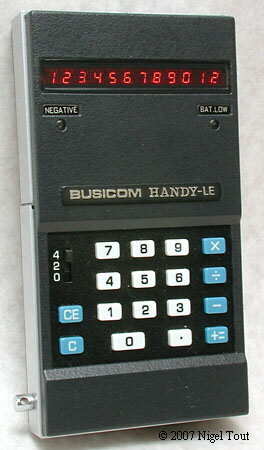 Busicom LE-120A "HANDY-LE" - LED display, the first "pocket calculator". 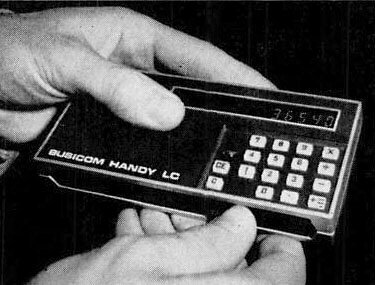 Busicom "HANDY-LC" - Liquid Crystal Display, never sold commercially. Busicom LE-120S "handy" - LED display, lower cost version of LE-120A. The first truly pocket-sized calculator. The first calculator to use an LED display. The first hand-held calculator to use a "Calculator-on-a-Chip", from Mostek. Display is 12 digits red LED. Four-function. Only has a fixed decimal point, with settings at 0, 2, 4 places. 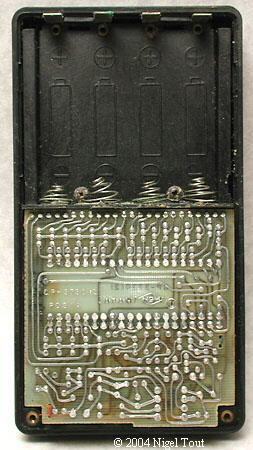 Integrated circuit - Mostek MK6010L "calculator-on-a-chip" (in this example date coded week 42 of 1972). Low-voltage version of the MK6010. 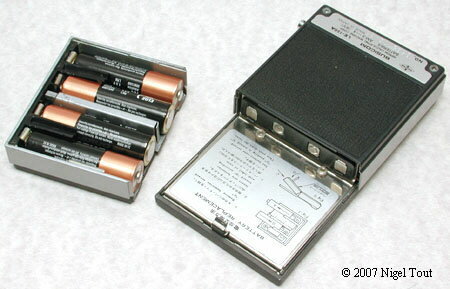 Batteries - 6v, 4x AA. Size - 72 x 124 x 24 mm (2.8" x 4.9" x 0.9"). Was announced in February 1971 at a cost of US$395 (about GBP £165). 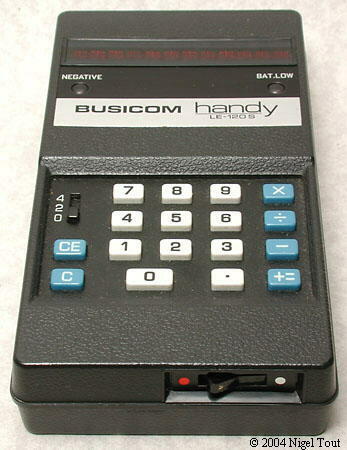 Made in Japan by Nippon Calculating Machine Corporation, which changed its name to Busicom Corp. (Business Computer Corporation). The first hand-held calculator to use a "calculator-on-a-chip" integrated circuit. See the article "The Calculator-on-a-Chip" on this site. 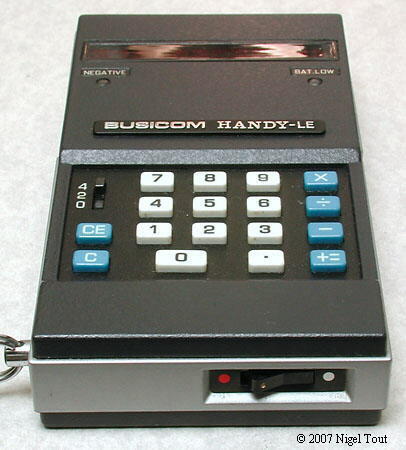 The capability of the "Calculator-on-a-Chip" to reduce the size and the complexity of the electronics was demonstrated in the 'before' and 'after' views of the Busicom Junior desktop calculator. 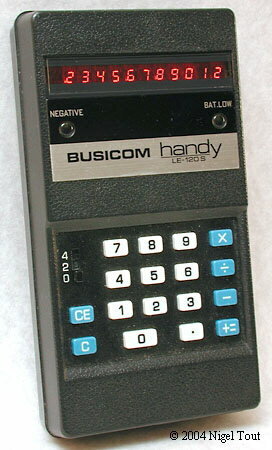 The Busicom Handy LE-120 was the first of a range of similar hand-held calculators introduced by Busicom in the early 1970s. The Mostek MK6010L integrated circuit and the LED display were state of the art at this time and were very expensive. Combined with the high-quality die-cast metal body, the price of this model was very high and it did not sell very well. Apparently, the most successful sales were to people like Aristotle Onassis, the Greek ship owner, who gave them away as gifts. Later models such as the plastic-bodied Busicom LE-120S described below were cheaper but still cost several week's average salary. However, the die had been cast and this model revealed that a truly pocket-sized calculator could be achieved. Over the following few years, as the technology improved and mass production took over, the price of pocket calculators plummeted. Since the calculator was so expensive, a wrist strap was supplied as an aid against being accidently dropped. The rear of the metal-bodied Busicom LE120-A. The battery compartment has a very neat release mechanism operated by raising the chrome plated lever. The label on the rear, showing the Nippon Calculating Machine Corp. logo. The On-Off switch is on the lower edge of the calculator. With the release lever raised the battery compartment can be removed. The battery compartment has been removed. This is made, as is the rest of the casing, of die-cast metal. 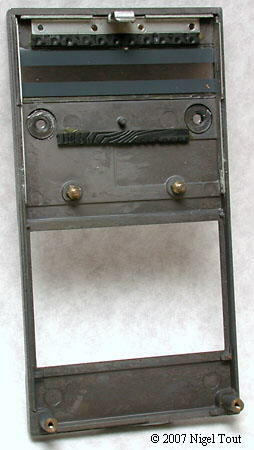 The die-cast front cover, removed from the calculator. The front cover has been removed, revealing the LED 7-segment display modules. Underneath the keyboard is the main circuit board, with the main component being the Mostek MK6010L "calculator on a chip". Close up of the main circuit board with the Mostek MK6010L "calculator on a chip" very prominent. 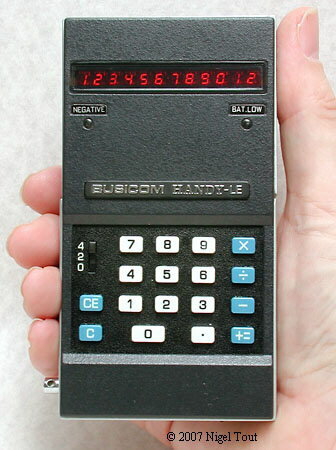 This low-voltage version of the MK6010 used in the Busicom Junior desktop calculator was the primary item that allowed the production of the first pocket calculator. The components with black domed tops are discrete transistors, which are required to sufficiently boost the current output of the integrated circuit to power the LED display. Distinctive features: Liquid Crystal Display (LCD) version of the Busicom LE-120A above. Never went on sale. Would have been the first LCD calculator. Display is 12 digits LCD. Integrated circuit - Mostek MK6010L. Size - a little larger than the Busicom LE-120A described above. Was announced in February 1971 at a cost of US$395 (about GBP £115). Made in Japan by Nippon Calculating Machine Corporation. The Busicom HANDY LC is a version of the LE-120A, described above, with a Liquid Crystal Display (LCD). LCDs were very new then and it is believed that insurmountable problems with the display prevented this calculator being sold commercially. Ragen Precision Industries also had problems getting its Microelectronic Calculator to market, which also had a liquid crystal display and was announced a little later in 1971. 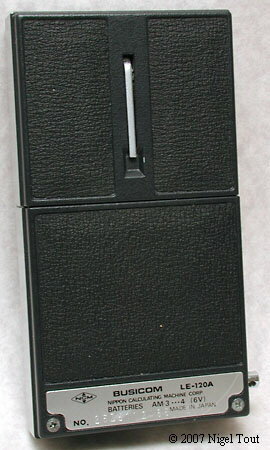 Distinctive features: One of the first pocket-sized calculators. More affordable by using a plastic casing. 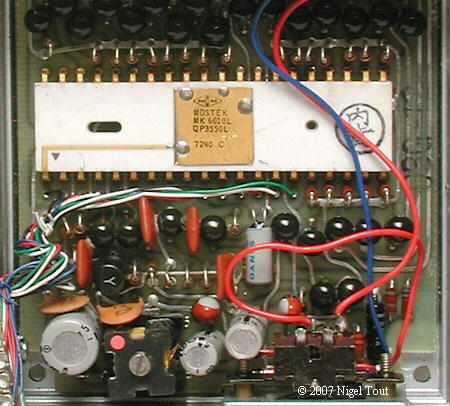 Integrated circuit - Mostek MK6010L (in this example date coded week 14 of 1972). 67 x 124 x 24 mm (2.6" x 4.9" x 0.9"). First went on sale in February 1972 at a cost of US$295 (about GBP £115). 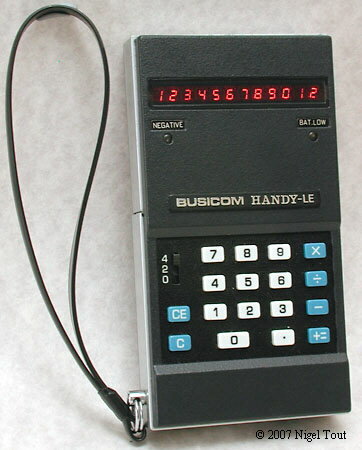 The Busicom LE-120S "handy" is similar to the LE-120A described above, but has a plastic body, and so was cheaper than the metal-bodied LE-120A. 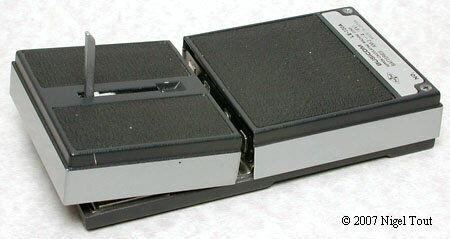 The layout of the LE-120S is identical to the LE-120A, including the On-Off switch on the lower edge of the calculator. With the rear cover removed, showing how all of the circuitry has been fitted in behind the keyboard. The electronic components are packed onto two small circuit boards behind the keyboard. On this board the white ceramic package of the Mostek MK6010L "calculator on a chip" integrated circuit can be made out behind the components at the front. Busicom (Nippon Calculating Machine Corporation) was at the leading edge of calculator development. The first truly pocket-sized calculator. The first calculator using an LED display. The first hand-held calculator using a "calculator on a chip" integrated circuit. 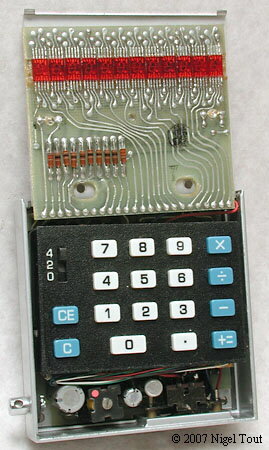 The introduction of the Mostek MK6010L low-voltage version of the MK6010 "calculator on a chip" integrated circuit combined with the use of 7-segment LEDs made it possible to fit all of the electronics of a calculator into a very small space, so producing the first pocket-sized calculator, the forerunner of many others. It is much smaller than the other contemporary "hand-held" calculators. 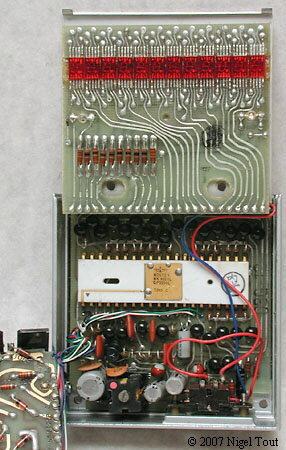 The preceding Mostek MK6010 "calculator on a chip" integrated circuit was used in the Busicom Junior desktop calculator. See the article "The Calculator-on-a-Chip" on this site which has details of the development of the Mostek MK6010. Ball, G., Flamm, B., (1997) "The Complete Collector's Guide to Pocket Calculators", Tustin, Wilson/Barnett Publishing, ISBN 1-888840-14-5, p41. "Microelectronics Shrinks the Calculator" Popular Science, Jun, 1971, p111.